The things that go bump in the night are sometimes a thief making off with your big-screen TV. Defender cameras are equipped with night vision that automatically activates. 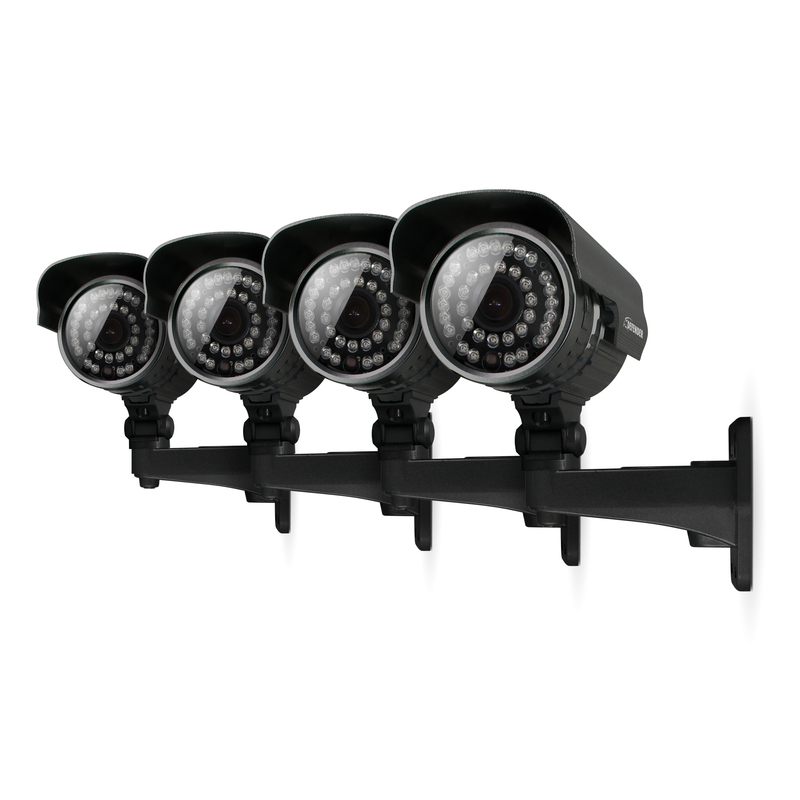 Thirty-six infrared ClearVu® LEDs provide crisp and detailed night imagery as you monitor from up to 100 feet away, even in complete darkness. So thieves may think they’re lurking in the dark but you can rest assured DEFENDER® will see them. Criminals don’t take the night off if it’s raining. Neither do our cameras. They’re weather resistant and ensure optimal picture quality no matter what Mother Nature decides to throw at you, be it rain, hail or snow. The professional-grade aluminum housing, complete with sunshade, will protect against rust, deterioration and glare. So no matter what’s going on outside, DEFENDER® will be ready. Our customer support team can be reached by phone, email and live web chat. You’ll always have access to an expert. Support is available in English, Spanish and French. 4 Outdoor security cameras, 4 65ft extension cables, power adapter, four-to-one power splitter, mounting hardware, quick start guide, window warning stickers, 1 year manufacturer's direct warranty. We purchased this model as a replacement for a much more expensive security DVR and it exceeds expectations in every respect. We are very happy with the clarity, ease of use and reliability thus far.